이 그림의 화면구성은 기본적으로 경상도 지역 영산회괘불화 도상과 유사하나 좌우 8구의 협시보살을 비교적 크게 배치하고 있다는 점이 특징이다. 중앙에 커다랗게 표현된 석가모니를 중심으로 8보살과 10대 제자가 둘러싸고 있는 간단한 구도를 취하고 화면에 도상들을 부각시켜 꽉차게 묘사하였다. 입상의 본존을 중심으로 좌우에 보살과 권속들이 둘러싼 이와 같은 형식은 18세기 경상북도에서 유행하던 것인데, 다른 작품에 비하여 보살이 본존의 어깨부분까지 올라오는 등 크게 묘사된 것이 특징이다. 불보살상의 상호는 이목구비가 뚜렷하고 양감 있게 표현하였으며, 육신선과 옷의 처리는 비교적 굵은 선묘로 힘 있고 유연하게 처리한 것이 돋보인다. 색채는 주색과 녹색을 주로 사용하였는데, 천공에는 백색 화문을 흩뜨리고, 황색과 분홍색, 녹색 채운을 활용하여 화사함을 더하고 있다. 아울러 보살상의 하반신 수식 장식에는 금박으로 처리하여 포인트를 주고 있다. 이 작품은 18세기 괘불탱 중에서 이른 시기에 조성되었을 뿐만 아니라 화풍도 뛰어난 작품이다. 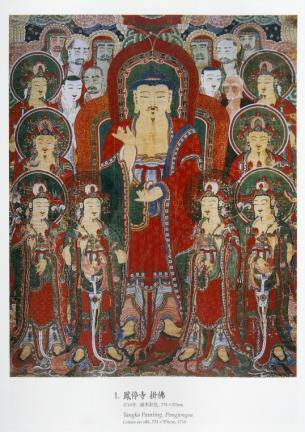 This painting, although similar in overall composition to typical Gyeongsang-do-style Buddhist paintings on the theme of the Vulture Peak Assembly, stands out, however, from them by the unusually large size of the eight attendant Bodhisattvas, placed on either side of Sakyamuni Buddha. The painting has a simple composition in which Sakyamuni is portrayed in the center, in large size, surrounded by the Eight Bodhisattvas and the Ten Disciples who are also rather large in size, so that they completely fill the available space. This composition with a standing main Buddha flanked by Bodhisattvas and other members of his retinue, on either side is widely seen in 18th-century Buddhist paintings from the Gyeongsangbuk-do area. In this particular work, the Bodhisattvas are much larger in size than in other similar paintings, with their head at the level of the main Buddha’s shoulders. The faces of Buddha and the Bodhisattvas have well-defined features and show volume and depth. The thick outlines of the body and the robe appear forceful yet flexible. In this painting having red and green as the two dominant colors, the white floral motifs scattered in the sky above the figures and touches of yellow, pink and green present here and there add brilliance. Meanwhile, the gold decorations on the lower bodies of the Bodhisattvas provide pleasing accents to the painting. An early example of 18th-century Joseon Buddhist paintings, this work is exceptional both in its historical significance and artistic merit.